Minnesota has numerous wonderful areas in which to live. If you love being outdoors, outside the Metropolis of the Twin Cities and away from downtown areas, then Rogers Minnesota is going to be a place you will want to see. A smaller community that is rapidly growing but has the convenience of major freeway access via Interstate 94. The estimated population in 2009 was around 9500 people. If you would like to be in an area where farms are the majority then Rogers Minnesota may be the place for you. There are 5 schools currently located within the city of Rogers: Rogers Elementary and Hassan Elementary, Rogers Middle School,Mary Queen of Peace Catholic School, and Rogers High School. For the advide outdoorsmen there is the amazing Cabellas outfitters store in Rogers and for those who love cars the Ellingson Car Museum. Currently there are over 1209 businesses registered in the city of Rogers. Once you have found the right home in Rogers you will need the right ROGERS HOME INSPECTOR. 7 County Home Inspection, LLC is a certified Rogers home inspection company. I will deliver the service and professionalism you need and are looking for in a home inspector. I am dedicated to providing more knowledge and technology in every home inspection for my clients. You will receive the very best home inspection possible in Minnesota. 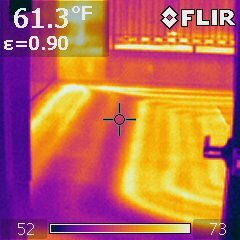 I use Thermal Infrared Technology with every home inspection and reports are delivered same in a detailed format with detailed digital photographs. Do not settle for just some guy with a flashlight walking around with a check list. Call us @ 612-919-3844 for a detail of services, quote or to schedule your home inspection.